Zing!!!!!!!!!!!!!!!! Yee-ouch. 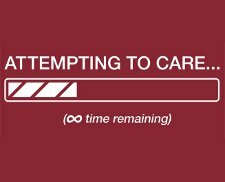 Somebody is saying something to you that holds no interest for you, then you just point to this Attempting to Care T Shirt, and they’ll know that you do not care at all. I mean it says infinity time remaining. That bar is not even a third of the way to caring. That things just gonna spin and spin and you’re probably just going to walk away as boring person is mid-sentence. Looks rude, however, you did warn them big time when you pointed to the shirt that Deez Teez designed for you to use as a social, get out of boring conversations, tool. Enjoy! But, use responsibly. Not sure you should use it daily with your spouse or significant other. That could prove to be disastrous for the coupling you currently sort of enjoy when they’re not speaking.